The cases have a sealed inspection window which allows verification that the Defibtech AED is functioning properly without opening the case. This allows the case to be sealed on yearly inspection and know that safety items stored in the case have not been removed. The cases have pick & pluck interior foam to allow configuring compartments for safety items such as the Ambu-Rescue pack and additional spare pads or batteries. The Neoprene perimeter O-Ring seal makes our cases completely waterproof and airtight. The cases are guaranteed waterproof to 30 feet under water. Silica Gel is provided to assure the internal humidity is low and mold does not form. The cases are entirely made of plastic. There is no metal that can rust and undermine the properties of our cases. 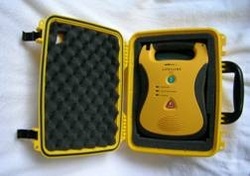 Our cases can safely be exposed and submerged in salt water or left in the rain. We do not use metal pins for the hinges, latches and handles. The pins are made of Acetyl resin which offers excellent lubricity and will not be affected by temperature extremes. Manufactured to exceed MIL STD's of 400 Lbs stacking, drop test at 48" and their humidity test of 95% at 120°F. Our cases pass the 100% humidity test (underwater). Our cases are airtight. This makes it nearly impossible to open them without relieving the interior vacuum that is created when experiencing changes in altitude and temperature. A Pressure Relief Purge Valve is incorporated under one the latches with its own O-Ring to guarantee a perfect seal. You will never forget to set the valve since it is automatically applied when closing your case. The pressure is relieved as you open the latch. Each case has 2 padlock holes so you can apply a safely seal to guarantee that your defibrillator accessories are intact. The holes also accept standard padlocks and we leave enough room so you can easily lock and unlock them. This feature is very useful when shipping a case to guarantee the case stays shut. 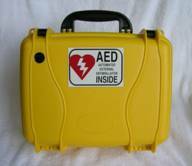 AED inside labels are on both sides of the case to allow quick identification in an emergency.